The process of hydraulic fracturing has been catching some unmerited headlines lately in relation to induced seismic activity. Despite what you may have heard, hydraulic fracturing has been a safe and proven technology for decades and does not pose a major risk of inducing felt seismic events. In reality, much of the concern over seismicity actually relates to wastewater injection, but the nation’s most renowned geologists, geophysicists and engineers are far from convinced that underground injection is a threat to public safety. 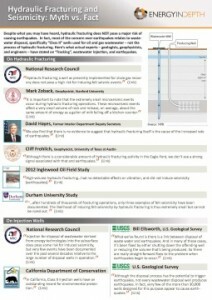 Download EID’s new infographic — “Hydraulic Fracturing and Seismicity: Myth vs. Fact” – to get the full story on seismicity, shale development and underground injection.